I love living in a small town. Familiar faces are always around the corner, in the supermarket, the restaurants, the hardware store, the pharmacy. I enjoy stopping to have a conversation with a friend I just happen to meet while doing errands. Years ago, while I was studying at the University, I decided this was where I wanted to make my future home. After college, I bought my first home here and have been comfortably settled in South County for over forty years. 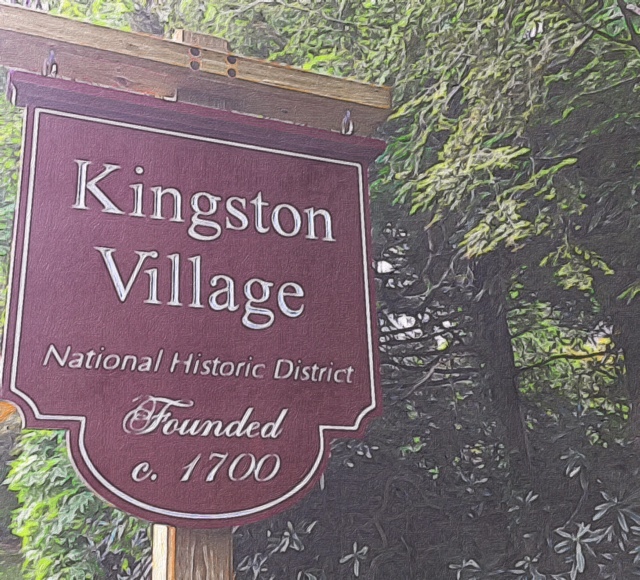 On Saturday I spent the day with friends celebrating our annual Kingston Hill Fair. Kingston Village, once known as Little Rest, is composed of charming buildings and red brick walks leading to the entrance of the University of Rhode Island. Although this picturesque village is quite small, it’s filled with history. In 1820, Fayerweather House was the home of the village blacksmith, George Fayerweather. He was a descendant of a slave who gained his freedom from the Reverend Samuel Fayerweather in 1770. He adopted his master’s surname, Fayerweather as was customary at the time. Some of the stones used for the base of the forge can still be found on the one-acre property. 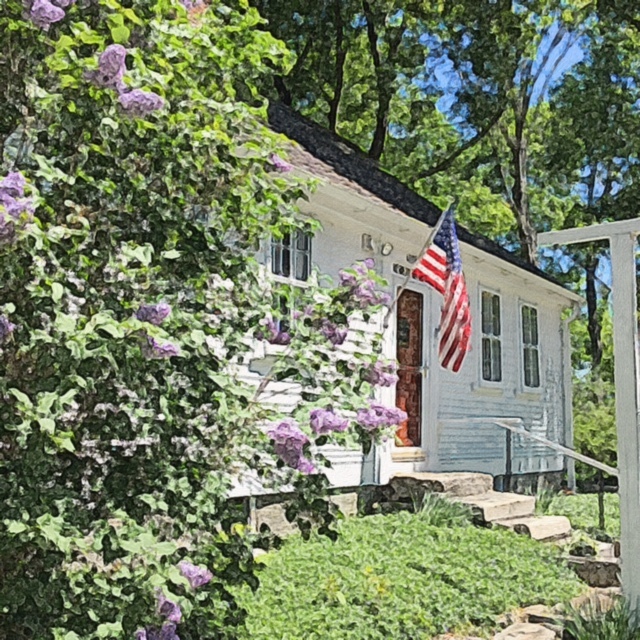 Authentically renovated and restored, the old homestead is now maintained by the Kingston Improvement Association and is the home of the Fayerweather Craft Guild. The Guild is dedicated to preserving old crafts and promoting new ones. The original three rooms on the first floor are now used to display those crafts. Workshops and programs are sponsored by the group throughout the summer and fall. Fayerweather House’s two stories were constructed around a massive stone chimney with a fireplace in each room. I spent most of my Saturday morning in the Keeping Room with its granite fireplace, Dutch oven, and 18-inch wide floorboards. Along with a pictorial display documenting the history of this building, there is a large Bicentennial Quilt sewn in 1976 by the founding members of the Craft Guild. Its thirty colorful panels of local landmarks hang proudly on the west wall among works by present-day crafters which are available for purchase. As crafters, we volunteer time in the store and this morning, on one of our busiest days, found me behind the counter taking care of regular visitors and the new faces in town for the weekend’s college graduation ceremonies. Inside, customers browsed while out on the back patio, johnny cakes (once known as journey cakes) from the local Kenyon Grist Mill were sizzling on a grill as people sat along the stone wall relaxing and enjoying the cakes with a cup of coffee. In the side yard, the Kingston Hill Gardeners were selling plants dug from their own gardens to raise money for scholarships. All of this taking place on the park-like grounds that they lovingly maintain throughout the seasons. Volunteers all – happily working and socializing on a fine May Day while down the road, on the front lawn of the Kingston Free Library (once the County Seat) another set of volunteers ran the used book sale. And across the street, at the Kingston Congregational Church, tables were set up with baked goods and hot dogs and hamburgers for strollers to take some time for lunch or a home-baked slice of cake or pie and sit conversing along the stone wall or under a tent in the church courtyard. The old town jail, now the Pettaquamscutt Historical Society, was open for tours as was Helme House where a pottery sale was attracting people in to view the works of local artists and the Kingston Hill Book Store was filled with browsers looking for collectible books and antiques. One of the most famous buildings in town is the Elisha Reynolds House (1738) now home of the Tavern Hall Preservation Society (1911). ) On March 5, 1781, Colonel Thomas Potter hosted George Washington and his officers when they stopped to rest on their way to confer with General Rochambeau in Newport. I was so busy working at Fayerweather House that I never had time to shoot some photos on Saturday. But these pictures, taken for my local mystery book Last Train to Kingston, will give you some idea of what our tiny village looks like on a typical Sunday morning, without all of the bustle a Fair Day can bring. If you are ever in Rhode Island, put aside some time to walk along the village’s brick sidewalks and note the historical plaques on each building. Stop into Fayerweather House, the library, the jail house, the bookstore, Helme House and the church. There’s an incredible store of history packed into a very small village once called Little Rest. As the world of politics makes for craziness here in the states, Kingston is a lovely respite. Gib would probably be very bored. What a gracious old village Clare! I loved your description of your fundraising day and the photos transported me to your home. Wonderful! Fascinating, Clare, It sounds a lovely place to live. Thanks for sharing the tour of your charming town. I know you’ll keep us all informed and you’ll have many places to stay, should you care to visit your blogger friends. Your hometown looks perfectly exquisite, Clare, and I rather regret never having travelled through your region of the U.S. That was rather remiss of me, in retrospect, as I had plenty of opportunity to venture North of New York in my trips there, though never once did. After I read Cider With Rosie I wanted nothing more than to live in the Cotswolds. I traveled there to go in search of Sheepscombe. It took hours of driving in circles to find a 1-way dirt road into the center of town. We came upon a herd of sheep and had to wait while they pressed around the car to get by. We found the town (Town being the pub, the church and the post office.) but it appeared no one was anywhere to be found. I intend to return one day soon. I’m sure Oxford and Bath are much changed from my time there in the early 70’s. Thanks for sharing your gorgeous little town. You painted such a beautiful picture, that I just want to move there. Won’t happen but a girl can dream…. I’ve spent some time in England and loved every minute of it. I look forward to visiting again soon. The Cotswolds always draw me back and I want to spend time on the Cornish Coast. New England does have some lovely little towns. Kingston is composed of actually only two sides of a street. It’s midway between New York and Boston which are hubs unto themselves and although I do visit the big cities, my temperament is more suited to a slower style of life. i fit in here very well. Small hometowns are the best! I love going grocery shopping in Plant City, and seeing at least 2 cousins, and an odd aunt or two! You are so blessed to live in this beautiful, serene village!! Hugs to Roxie, please! And special Lucy hugs to you! Fun! Thank you for taking us along with you through these photos, Clare. I decided in my younger years that I wanted to find a quiet place to live my life. Although the area has grown in leaps and bounds since I was at the University, it is still quieter than most places I’ve been. I think I’ll do more posts about some of the interesting places here in southern RI. I know I love it when other bloggers write about where they live. Then it’s decided! One more coming up. I think I’ll do the Kinney Azalea Gardens next. I would really love to know more about Edenton. I enjoy it when bloggers post photos and do pieces about where they’re living. It’s what gave me the idea to do some local travel posts.There are some other towns in Connecticut I would really like to feature. I tend not to get very heavy on the history -just a link or two – and try to capture the place with a photo collage.Thanks, Jo. So charming! The patchwork and crafts look amazing! I may do a post on that patchwork Bicentennial Quilt. The 30 patches hold an amazing amount of history in regard to the places each patch represents. I could do close-up photos of the squares. That sounds fascinating. I would love to hear more about that and see the squares in more detail! I so enjoy textile crafts- although I’m quite an amateur. What a lovely celebration of your village Clare. Loads of history and also plenty of interesting things happening in the here and now. Gail, the main roads unfortunately are too narrow and to busy at times for bikes but we do have a bike path running through each small village. There are several that make up South Kingstown. Yes, it’s quite lovely and sitting on the front lawn of the old library makes for great people-watching. This week I’ll be working on the front landscaping of the church courtyard. It needs a lot of help! What a beautiful place to live in – lucky you! I love our small city although it is newish and it is great to know all the shopkeepers and neighbors. I don’t live right in the little town but more outside in the woods across from a wild-life sanctuary. I worked in city schools most of my life, so going home to the woods was a respite each day, even though it entailed an hour’s drive.There is a comfort now-a-days to know your neighbors. It’s not really something we see in the cities any more here in the US. It is such a shame when people don’t know their neighbors. Half of our street had to wade through our flooded street to go to a wine party but it was fun. A neighborhood pool party! With wine! What fun! Hurricanes and loss of electricity always brings us together out here in the woods of West Kingston. What a lovely hometown. It must be a treat living there. Live the pics. Thank you. It’s where I went to college and I loved it so much, I decided to move to the southern part of the state after graduation. No regrets. Your village looks like a wonderful place to live, Clare – my kind of place completely. It’s so full of interesting history, and proudly cared for by the residents. Your photos are lovely and show many different aspects of the village. Great post! All of the posts by bloggers like you, who take me to their own wonderful villages and towns, inspired me to write this. I loved the information on the Cornish people in your last post. If I never get there, at least I’ve experienced it through your eyes. Thanks, Millie. What a confidence in me. I shall run and come again. I am scared of my wife. If she had to think so. You are a charming poet, Shiva! I am a Charming Poet, Wow!!! Let it be very clear, Clare! Yes, we are a global village and isn’t that wonderful! So much to learn and enjoy among the inhabitants of our own global village. An education and a celebration rolled in together – so many styles, so many personalities, so many different voices. It is quite exhilarating!